sock prØn. 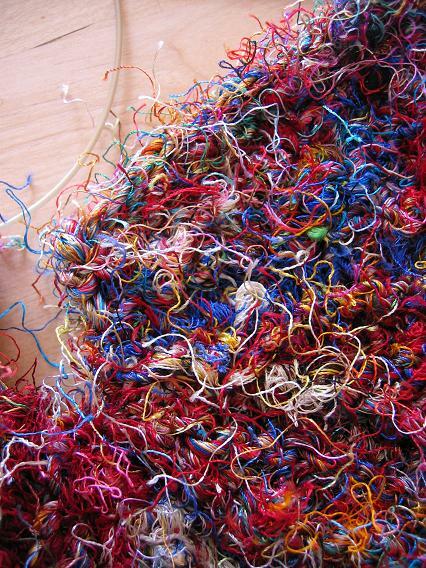 : Squares, socks, sari silk... alliteration twitterpation. Squares, socks, sari silk... alliteration twitterpation. These squares were fun, but the most fun was after they had been blocked and dried; my son had *the* best time playing with them on the tabletop as I was packaging them up for Canadia... its inspired me to be on the lookout for afghan/knitted block books to make an afghan for him. (Barbara Walker's Learn to Knit Afghan Book? 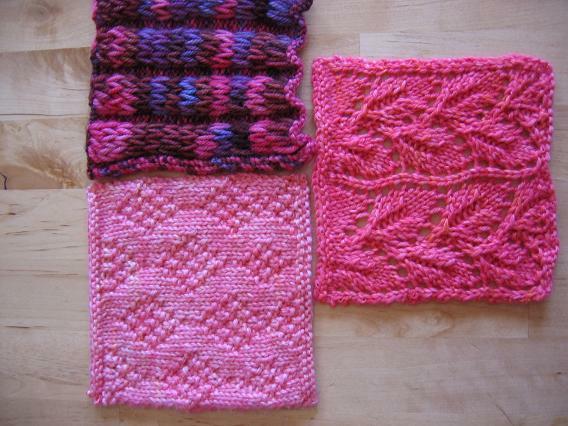 I saw a couple of great squares on Jason's blog... any other recs for afghan/knitted squares in books?) It'll be one of those ongoing projects, a sqaure or two at a time-- can I sew them together at different times? Cos I know babybear will lose them if I let him play with squares for too long a time. The sari silk is so hairy. I don't not like it, but can see myself knitting this in .. banana silk? Something else in the future. Great pattern. The start date is correct, too (yesterday!). I just have powered thru them, and it felt great. 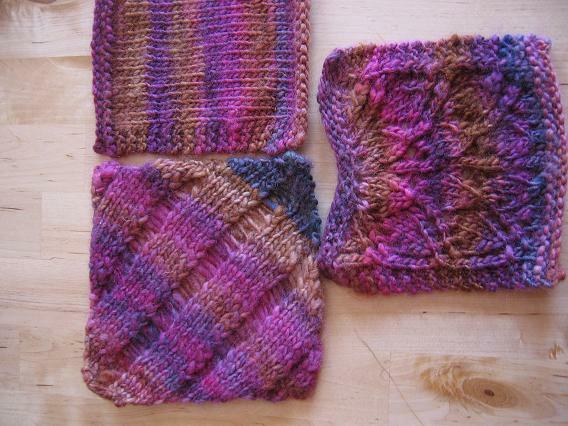 As nice as knitting the squares and the sari silk purse was, I missed knitting socks. I'm already thru the gusset decreases, and just have the length of the foot to complete. The cuff is a little longer than my usual fare (7" or so to top of heel), but I'm digging my Child's Shell socks with their long cuffs, so maybe it'll be a new thing for me. I like the color of the yarn, but I don't think I necessarily like them together like this... don't know. I *do* really like the Kona Superwash again-- what fast knit socks! Anyone else have dk weight pattern recommendations (aside from Sensational knitted socks)? I just have a ball knitting them and finishing a pair so soon. It sounds weird, and took several rows to get used to, but I can totally see a difference in my ribbing. 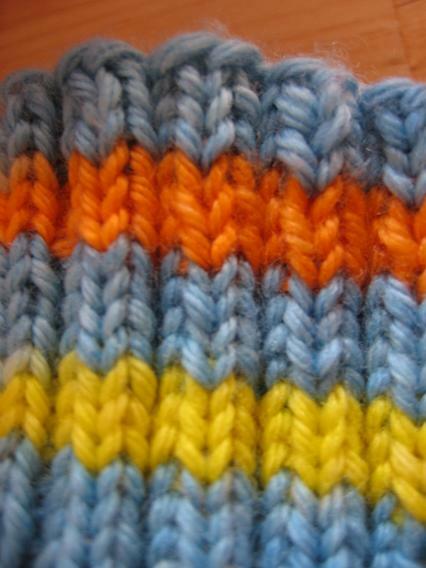 Here's an up close pic-- the 1st 5-7 rows were my regular knit/purl, afterwards is the combined knitting in action (about after the 1st orange row). You can see near the top where the ribbing is wonky. It would clear up in blocking or in the wash, but the difference (to me) is noticeable in the lower rows, no weird knit stitches previous to purl stitches. (I admit I photog'd the worst example I could find in the ribbing.) Basketcase is a cool pattern to practice combined knitting on, since you're not always purling/knitting in a column so its more interesting than straight rib and I think it definitely looks good. Compliments of C. Schurch's advice in Sensational Knitted Socks for picking up extra sts at the gusset to eliminate any holes. I dig the look of different textures here. Phew. Back to the sock, been away too long! 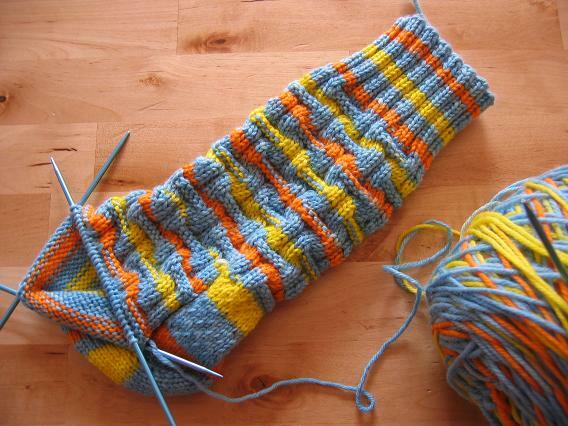 Love the way your Basketcase socks are striping! Your Easter egg yarn turned out soooo nice! Love your squares, too. Can't wait to see the finished sari silk bag. I never realized looking at it on eBay that it's that hairy! I'm so glad you used the word "wonky" on your blog! I use that word a lot, and no one believes it's a word. At least I can show them someone else uses it! (They also use it in an episode of George Shrinks.) I've always been told that people need a "Sheri Dictionary" cuz I either use words that aren't words or use real words in ways other than what they really mean. At least I know what I'm talking about... usually! Great colours in that Santa Cruz! Re afghans: it's not a book, but have you you seen http://www.knitting-and.com/knitting/patterns/afghans/sampler.htm ? Your Easter dye yarn looks amazing - I wasn't sure how bright the colors would turn out - bright they are. Super pretty. As is your purse and Basketweave sock!!!! Hi yourself! 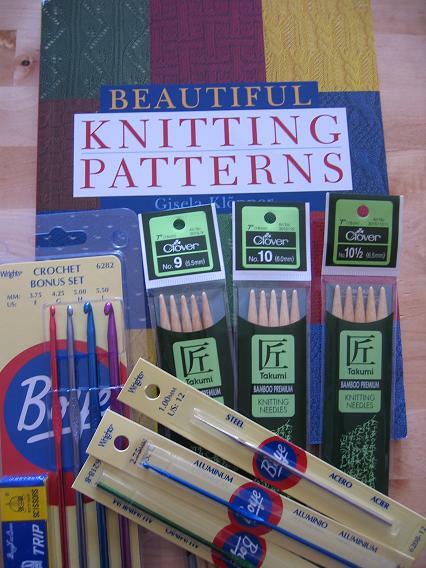 I love the LTKA book, and have been interested in the Great American Aran Afghan as well. I am so jealous of your book! I still have a 40% off coupon so maybe I should go back tomorrow and see if my Joann's has it! Wow, you've sure done a lot lately! I love the new socks you are working on the Basketcase ones), they are looking great so far. Woohoo! Thanks for the plug ;) Your squares are great, and I love the Basketcase socks too. 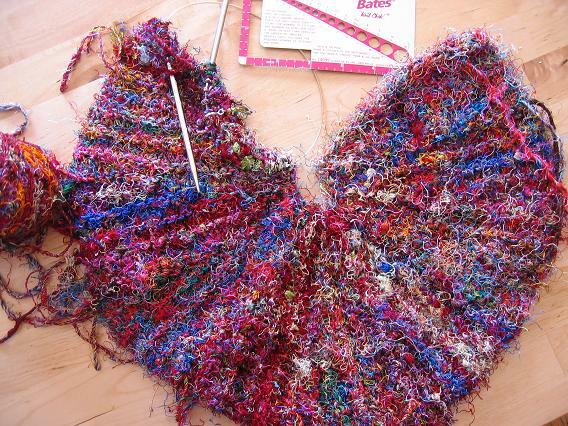 Your blog is aptly named-- so much sockyarn Pr0n!! Yum! 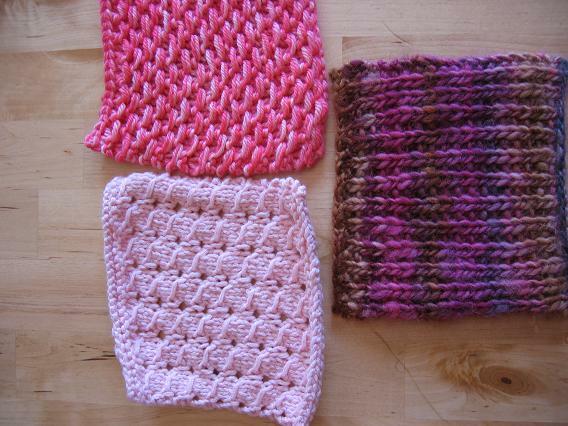 Here's a link to some afghan squares. Just pictures and info on where the patterns come from. Not actual instructions. But quite inspiring. I love both the basketcase socks and the openwork slip stitch pattern! I'll be keeping my eyes peeled for other DK weight patterns for the HA I have also! The Easter Egg dye really turned out bright and clear, way more so than I expected! 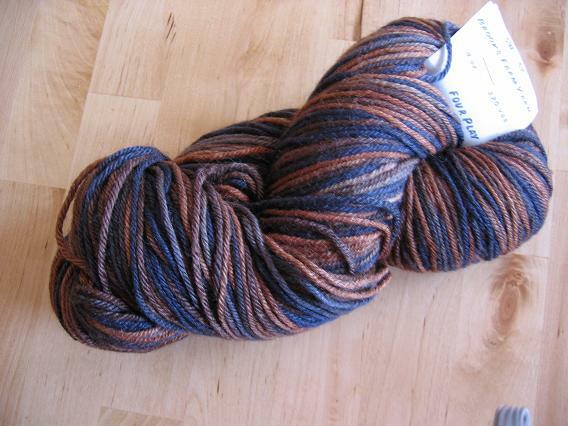 I'm really looking forward to trying to dye some sock yarn I have. I'm also really interested in that sari yarn, can't wait to see the bag! Wow! so much going on in this post. Your squares look great, all the pretty pink patterns and your sock are great, I just ordered myself sock needles and I am keeping my eye out for the perfect sock yarn and it's all your fault!! I can't resist after seeing countless gorgeous pics!! Great yarns! OH MY!I've never tried that kona superwash looks very yummy your making me want to get some myself! You've got so many great squares and awesome colors! Wow! you're a busy knitter! 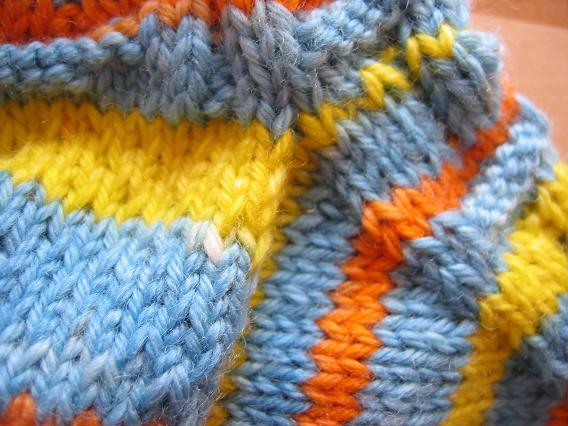 Love the squares, the stitches and yarn are all beautiful. The Basketcase sock is very cool. I will definitely need to check out that pattern! Nice squares, such variety and fun colors, too! I love those JOann sales. Those socks are cool! Thanks for sharing the link to the pattern.